As mentioned in the earlier post, most of today’s standing structures and lintels of Preah Vihear were constructed during the reign of Suryavarman I (1010-1050). He has often evoked researches regarding expansion of Khmer Rule in present day north-east Thailand; constructing new temples; renovating/adding new structures to existing temples; as well as strengthening Iconography of Dancing Shiva in temples, which was already documented by Pre-Angkor rulers as early as 7th century ACE. Here is another temple devoted to Lord Shiva, towards the southern end of today’s Cambodia. Phnom Chissor, built during the rule of Suryavarman I, displays the sculpture of Adalvallan/Dancing Shiva. The temple offers no disappointment- one can find Shiva’s humble devotee, Karaikkal Ammai sitting below Him watching his eternal dance. To the left of shiva is the person with ‘muzhavu’ – the percussion instrument. 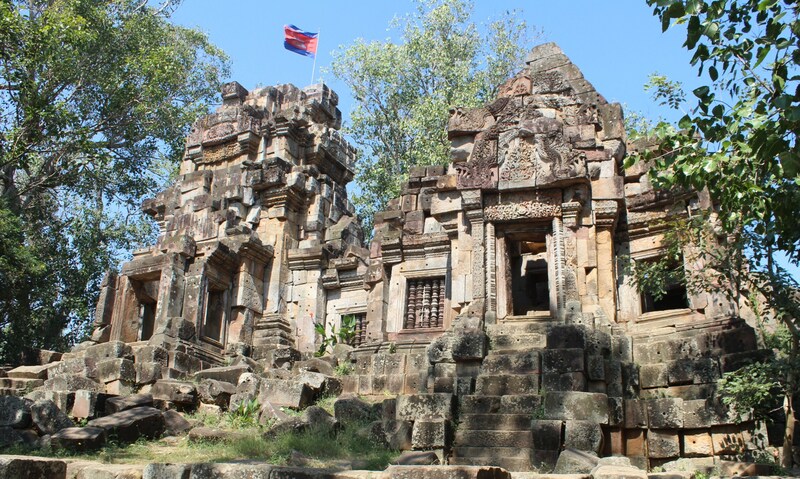 Like Prasat Preah Vihear built on top of Dangrek Mountains, Temple Phnom Chissor is also built on top of Mount Chissor; and was originally known as ‘Suryaparvata’ or the mountain of the Sun God, named after the King who constructed it. The Shiva Lingam or the main deity of the temple was called ‘Suryavarmeswara’. Located in Takeo Province of Cambodia, about 70 kms south of present day capital Phnom Penh, reaching Phnom Chissor requires a climb of more than 400 steps from the southern entry to the temple. The impressive sandstone lintels and intricately designed doorframes are testimonies to a majestic Empire’s architectural inclination. 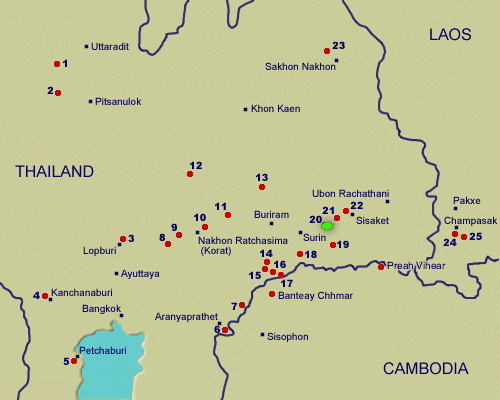 Map below shows north-west Cambodia with province Battambang (Vat Baset), northern Cambodia with Preah Vihear and southern Cambodia with Phnom Chissor, where Dancing Shiva with Karaikkal Ammai was sculpted during the 11th century ACE. These temples belong to the 11th century ACE. 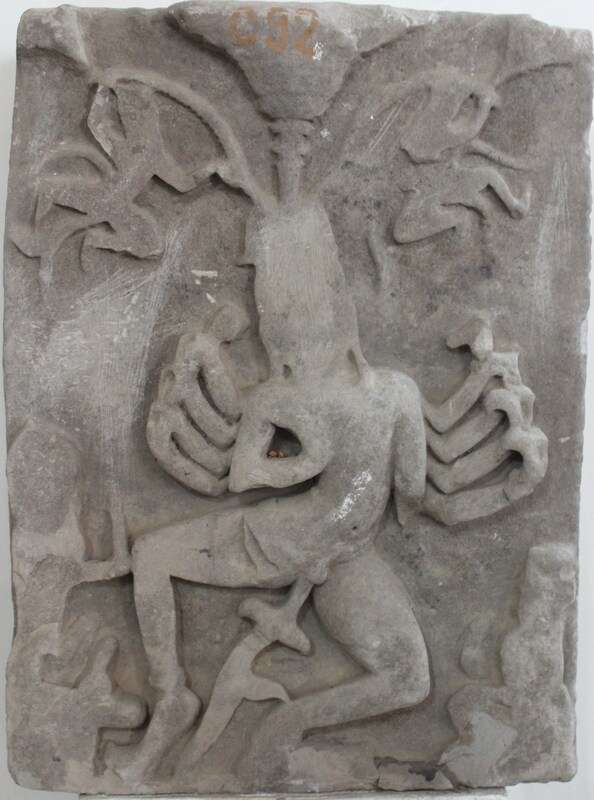 But, the worship of Shiva Nataraja in Cambodia dates back to early 7th century ACE. 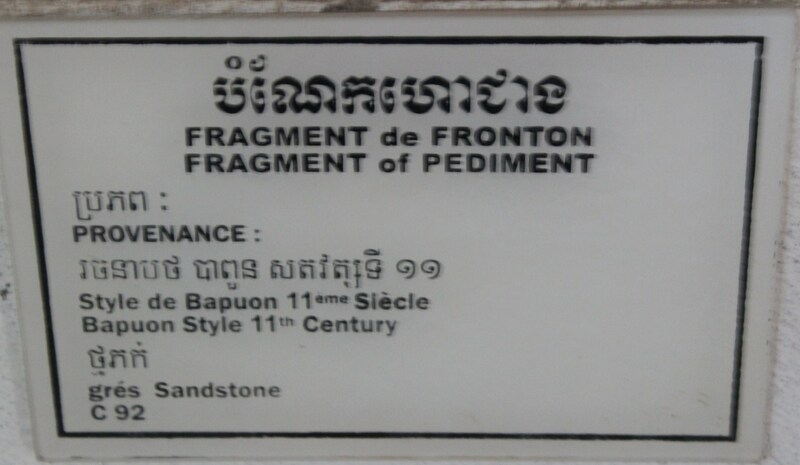 The Isanapura inscriptions of Isanavarman I in Sambor Prei Kuk mentions it. 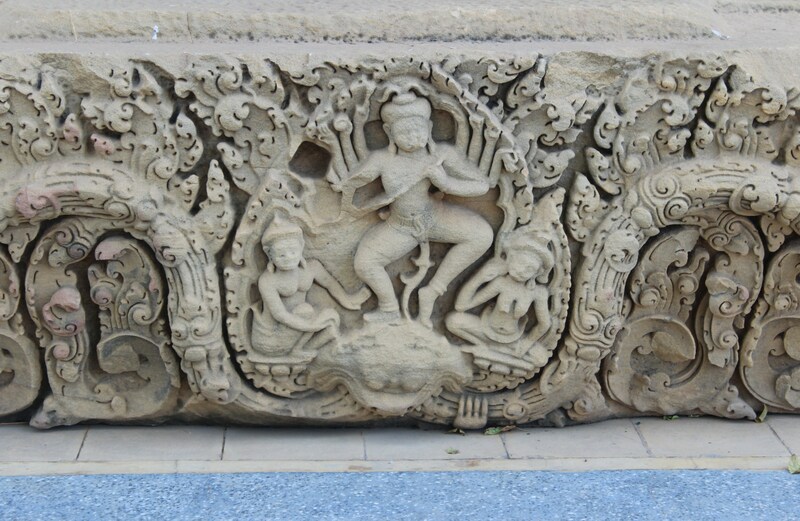 The dancing Shiva in Phnom Chissor doesn’t have 10 arms, but the common string instrument in the hands of the eternal dancer is something to be noted. 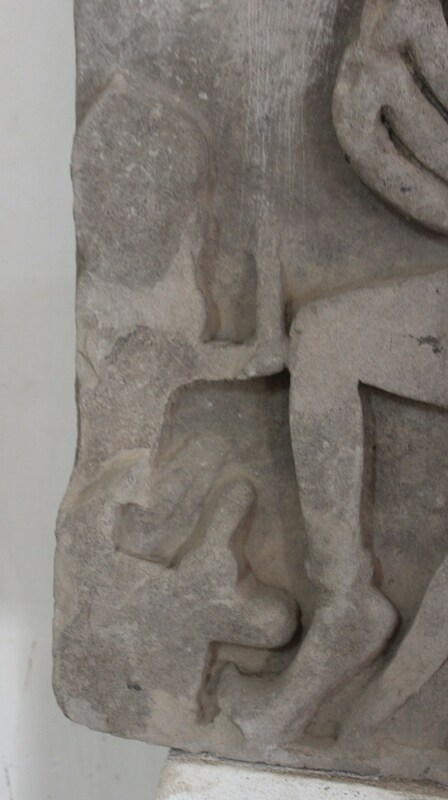 The sculptors of Adalvallan in Battambang, Preah Vihear and Phnom Chissor have given an instrumental possession to the Dancer and they are similar too. Mireille Benisti, French scholar and researcher of early Khmer Art and comparative Indian Art and Iconography, first published an article in 1967, in ‘Bulletin de l’École française d’Extrême-Orient’ under the topic – ‘Notes d’iconographie khmère’ – the title of the article being – ‘AU SUJET D’UN LINTEAU DE VAT BASET’ (On the Lintel of Vat Baset). In the previous post, it was mentioned that Mireille Benisti published an article on Karaikkal Ammaiyar in Vat Baset in the year 1976, based on the book ‘Karaikkalammaiyar: An iconographical and textual study by Peter J. J. de Bruijn. However, subsequent online searches revealed that she could be the first scholar to have noticed Karaikkal Ammai in Khmer Temple Art. 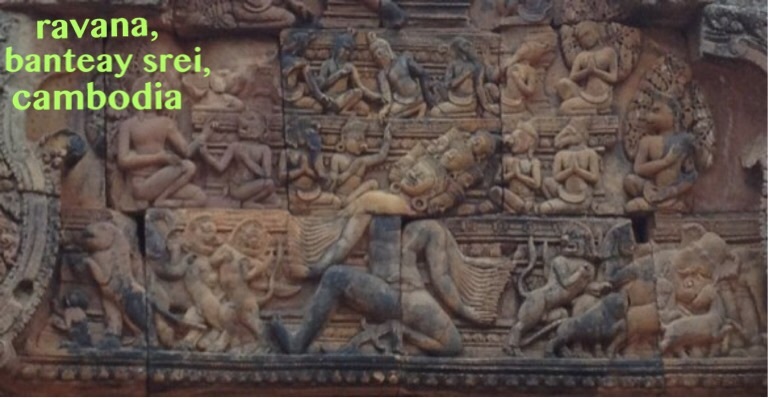 She first documents the iconographic presence of Ammai in Vat Baset and then in Banteay Srei and Prasat Hin Phimai (Thailand) in her articles in the same Bulletin in 1967 and 1969 respectively. According to Ms. Benisti, ‘the Baphuon style’ of the temple architecture and the inscriptions in the sanctuary (Vat Baset) may date back to mid-eleventh century, during the reign of Suryavarman I, but the lintel of dancing shiva and karaikkal ammai might belong to the second half of the eleventh century, an assertion, she attributes to the style of Kala Head, Branches and other ornamental representations sculpted in the temple. This lintel mentioned by Ms. Benisti couldn’t be located in Vat Baset during my visit in December 2014. 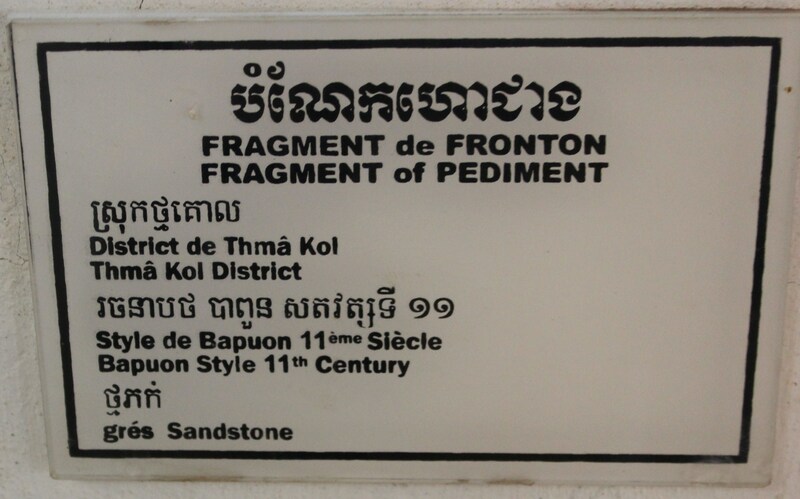 I feel the picture published by Ms. Benisti is similar to the lintel found outside Battambang Museum. Hence, the lintel that Ms. Benisti saw at Vat Baset in 1967, could possibly be the one currently (December 2014) placed outside the Museum. She also explains about the ten armed Adalvallan dancing between two female characters. 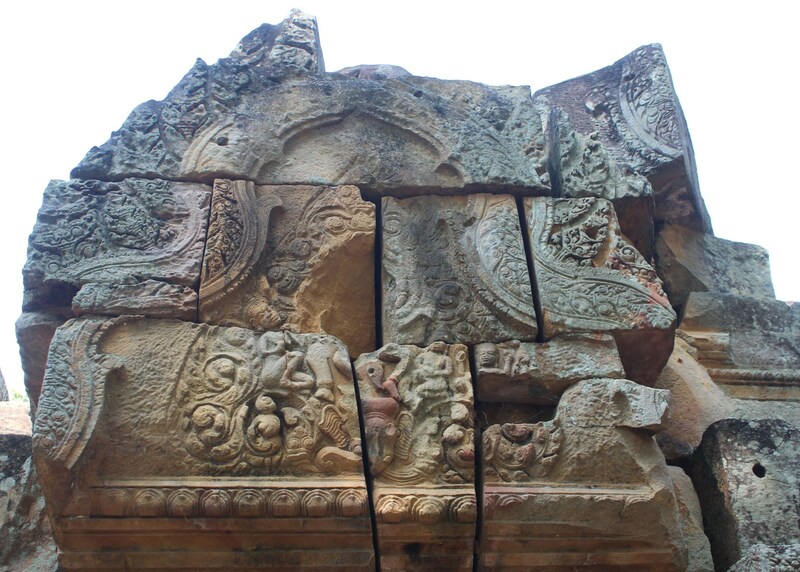 The earliest sculpture of Karaikkal Ammai in Khmer Land – Banteay Srei Temple, built in the year 968 AD. In continuation of the last article, our place of interest in this post is Battambang Province of Cambodia. 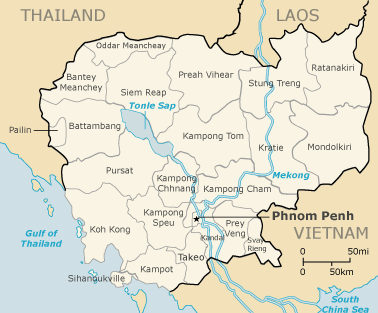 Battambang Province lies in the north-west of Cambodia. The city of Battambang is the second largest in Cambodia, next to the capital Phnom Penh. It is the country’s leading rice producing province and hence called ‘the rice bowl of Cambodia’. The area Battambang occupies a special place in our search. The two temples Vat Ek and Vat Baset where Karaikkal Ammai is reportedly sculpted, are located in the province of Battambang. 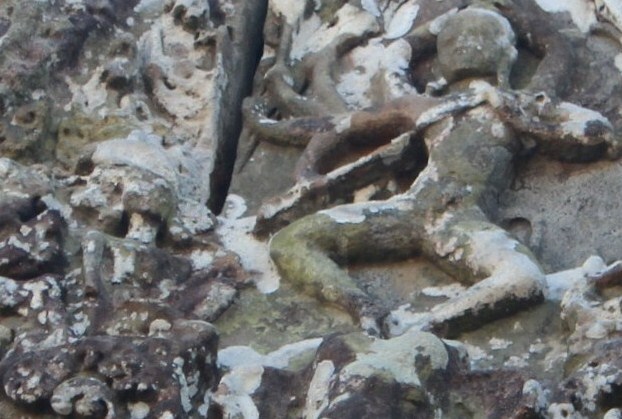 Additionally, it is also in close proximity to various other temples which belonged to the Khmer Empire, where our beloved demon devotee is seen alongside Dancing Shiva. Few other temples are situated in present day Thailand. In this context, the North-West of Cambodia and North-East of Thailand host some of the most beautiful creations and interpretations of Devotion of Karaikkal Ammai in stone. a. This one shows Battambang Province of Cambodia which borders Thailand. Today, the western part of Battambang shares the international border with Thailand. b. 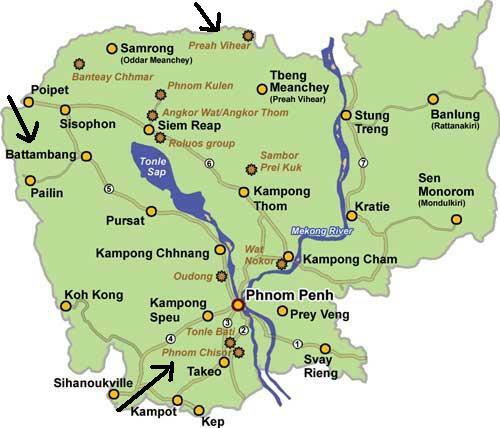 This map shows the Khmer temples in Thailand and Laos. The north-east of Thailand has many Hindu Temples dedicated to Lord Shiva like Prasat Muang Tam, Prasat Phimai, Prasat Sikhoraphum and Prasat Phanom Rung. host the sculptures of Karaikkal Ammai with Dancing Shiva. We shall see the pictures in later posts. As mentioned before, the Comparison or the Relationship of Khmer Temples currently existing in modern day Cambodia and Thailand shown above through the map, is to specify the common thread ‘Shiva’, especially ‘Dancing Shiva’ and the presence of ‘Karaikkal Ammai’. According to available historical sources, these temples were built by Khmer rulers with basically similar temple architectural styles and even today extensively preserve iconographic structures related to our current topic of interest – ADALVALLAN-KARAIKKAL AMMAI (dancing shiva-karaikkal ammai). Ammai has been an intertwined matter of importance when it came to sculpting a panel of Adalvallan/Dancing Shiva or Nataraja. This is indeed a very vital proof of the connection of the Tamil Kingdoms with the Khmer Empire. 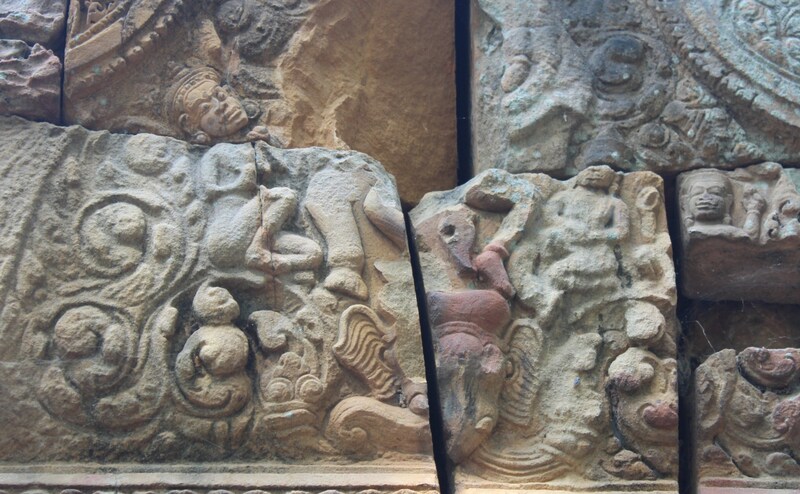 The earliest sculpture of Karaikkal Ammai in Cambodia seems to be in Banteay Srei, which is a 10th century ACE temple. 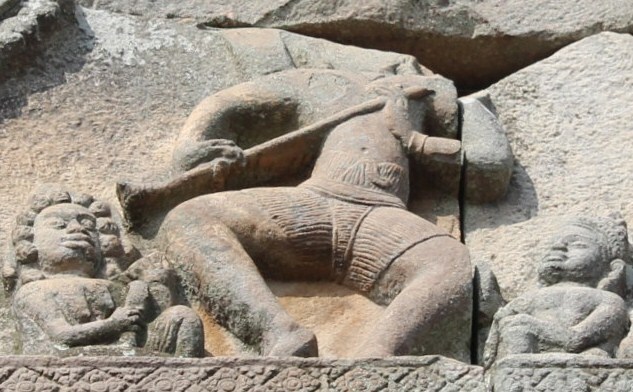 Just because the Cholas were ruling Tamilagam at that point of time, and the most popular of the sculptures of Ammai belong to the Chola Temples, can this be called a Chola-Khmer Connection? Certainly yes, yet cannot be concluded without adequate historical research. We also need to see the earliest of Ammai Sculptures in Tamilnadu. Even before her sculptures were created, she was a great influence on other Nayanmar Saints and commoners alike before the Cholas came to power. Her hymns in praise of Lord Shiva, helped the Tamil Society connect with their Lord in the language they understood rather than in a language that was made to believe that the Lord understood. It should be noted that there are epigraphical evidences on Thevaram hymns (sung by 63 nayanmars) being recited in temples during Pallava King Nandivarman III in mid 9th century ACE. Therefore, before the Kings could bring her in stone and bronze in their temples, her Tamil hymns had entered the souls of the Tamil people and were sung in many Shiva Temples. Karaikkal Ammai who was born in the Pallava Terrain in Tamilnadu, glorified by other Nayanmars during the rule of Pallavas and her hymns recited in many Shiva Temples during the Pallava reign, gently glides into Chola Terrain, where she is immortalised in the most extra-ordinarily built temples like Thanjavur Periya Kovil and Gangai Konda Cholapuram. But before Thanjavur and Gangai Konda Cholapuram temples, Ammai has been sculpted in a few other temples in the Tamil Country. While we see her gentle glide from one Empire to the other in Tamilnadu, her transit eastward towards Cambodia and Thailand is certainly a ‘Need To Know and Explore’ Travel Package. This is a 11th century temple built during the reign of King Suriyavarman I (1002-1050). It is located on a foot hill and presently only ruins of an ancient hindu temple can be found. There is a Buddhist Temple in front of the ruins. When we went in December 2014, we couldn’t find Karaikkal Ammai in any of the lintels in the temple. Could the lintel with ammai be damaged due to natural or man-made ruins or kept in the lot of piles of broken lintels and stones in and around the temple, or luckily kept or taken to any other museum… only further searches and researches would tell. But no known description could be seen. Vat Baset has been written about in the last post (karaikkal-ammaiyar-revered-mother-of-karaikkal/). 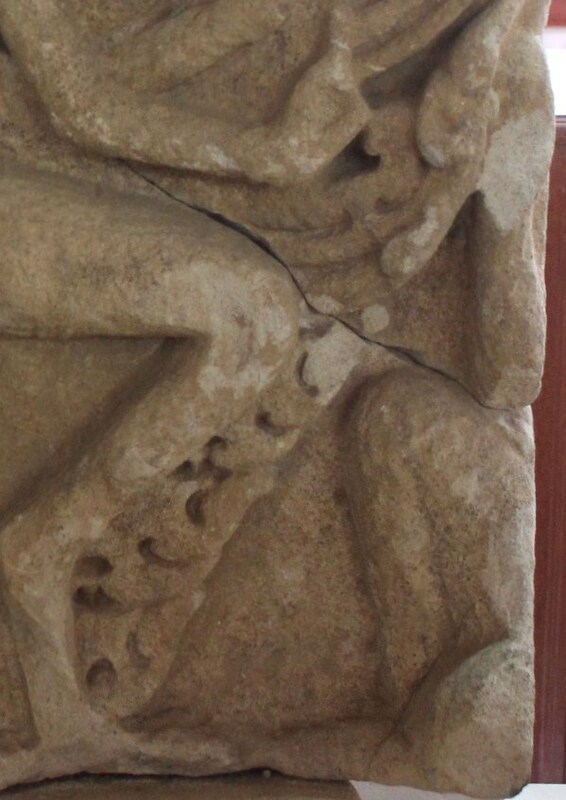 Two pediments in truly ruined form were found in Battambang Provincial Museum which seem to look like Ammai. I leave it to future researchers to arrive at a conclusion aided by further scientific investigations. and thin structured Ammai to his right? At the entrance of the museum, is placed a lintel with Dancing Shiva with a string instrument in his hand and accompanied by two women by his sides. One is his consort ‘Devi’ as the Museum booklet mentions and the other is Karaikkal Ammaiyar. This lintel is a clean/clear one. Devi, one of Shiva’s consorts, sits on a lotus near his right foot. Her outstretched arm reaches toward Shiva’s leg. An emaciated Karaikkalammaiyar with pendulous breasts sits on another lotus flower at Shiva’s left foot. 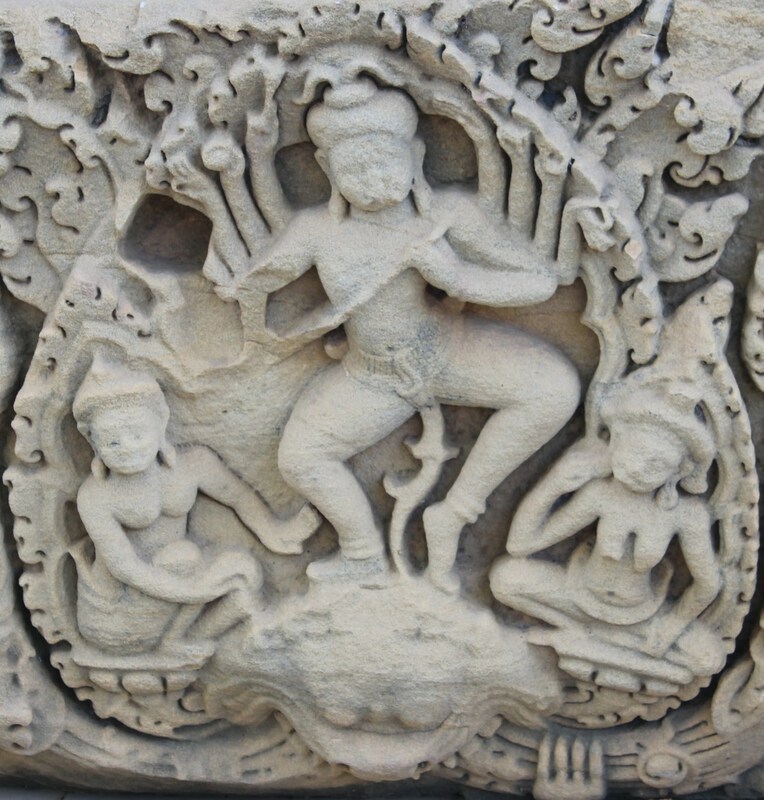 In Khmer Iconography, an emaciated Karaikkalammaiyar is often seen crouched at the feet of dancing Shiva, marking the rhythm of his dance with a pair of cymbals. 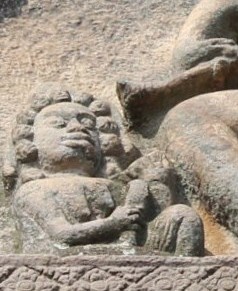 Here, the sculpture mentioned as Devi seems to be playing the ‘Muzhavu’ an ancient percussion instrument of the Tamils. 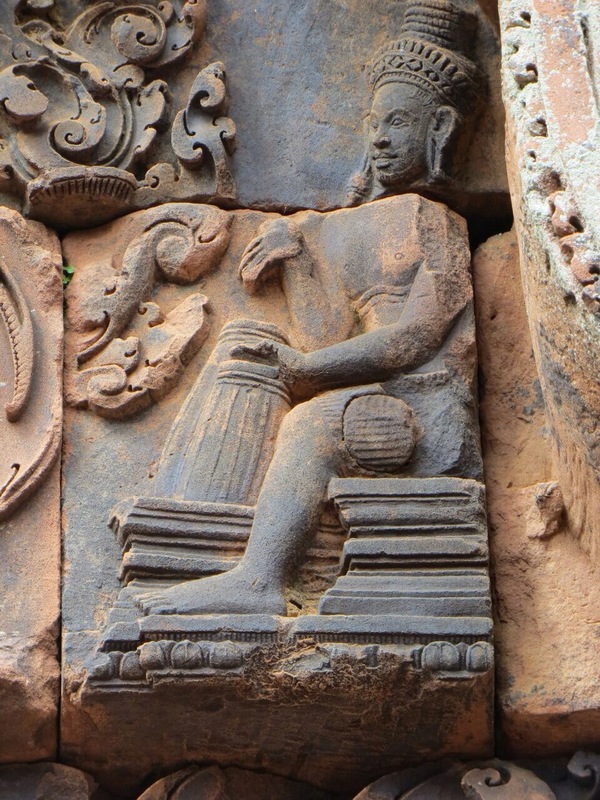 This looks like ‘oru mugha muzhavu’ or a single drum instrument that can be seen in banteay srei sculpture too – dancing shiva with ammai on one side and a person with a single drum on the other. This is again a separate topic of research whether the sculpture of Vat Baset at Battambang Museum also plays the ‘oru mugha muzhavu’ – the percussion instrument. 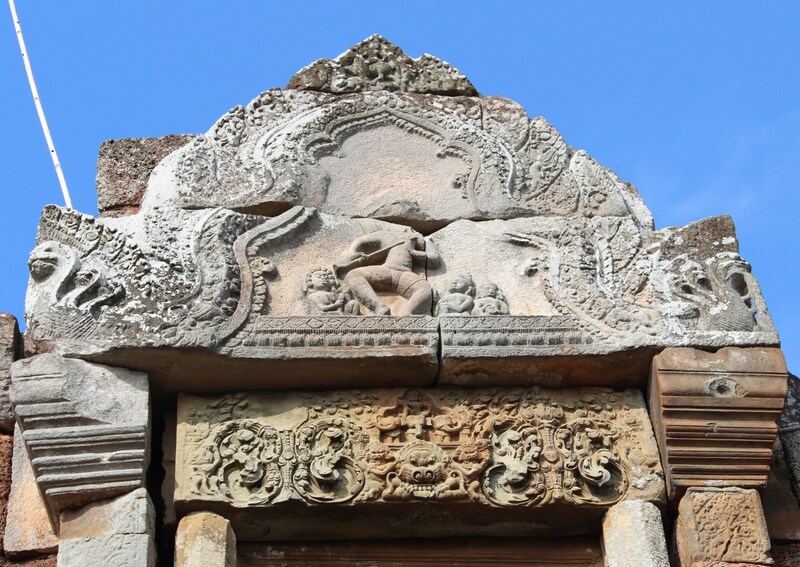 Four of the six temples of Karaikkal Ammaiyar in Cambodia (banteay srei, vat ek, vat baset, preah vihear, phnom chissor and angkor wat) mentioned by Peter J. J. de Bruijn, four were built by Suriyavarman I, during the first half of 11th Century ACE. Suryavarman I built Vat Ek, Vat Baset and Phnom Chissor. 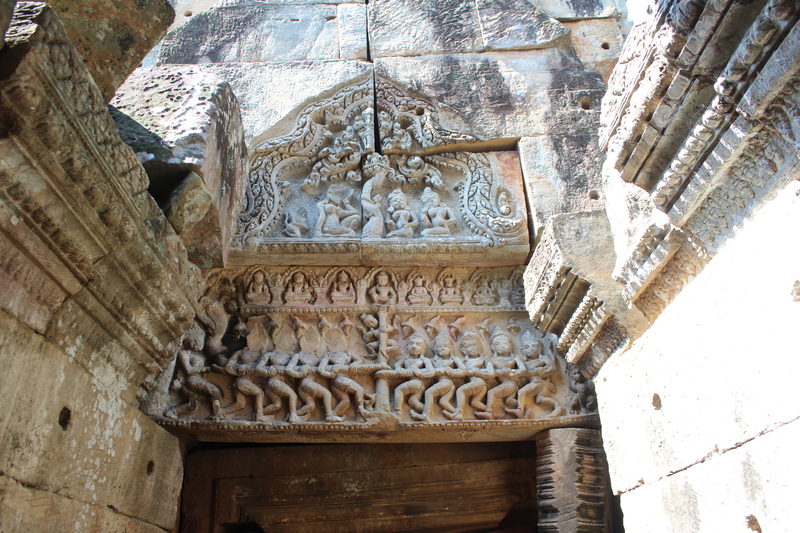 In Preah Vihear temple, the construction of which started in early 9th century ACE – preserved and redeveloped by various rulers until 12th Century ACE, most of the surviving lintels are by Suryavarman I and later was restored by Suryavarman II. The Monumental Preah Vihear Temple – which the Khmer prefer to call the Khmer Sancturary than a Hindu Monument is located in the Preah Vihear Province of Cambodia. 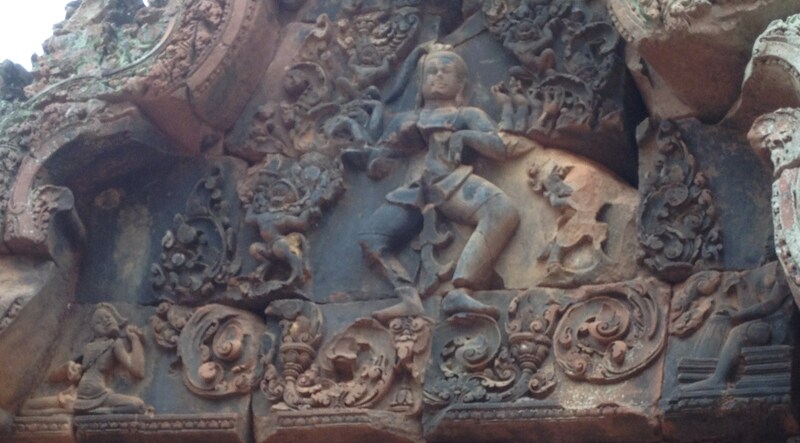 We shall see Karaikkal Ammai with Dancing Shiva in Preah Vihear in the upcoming post.